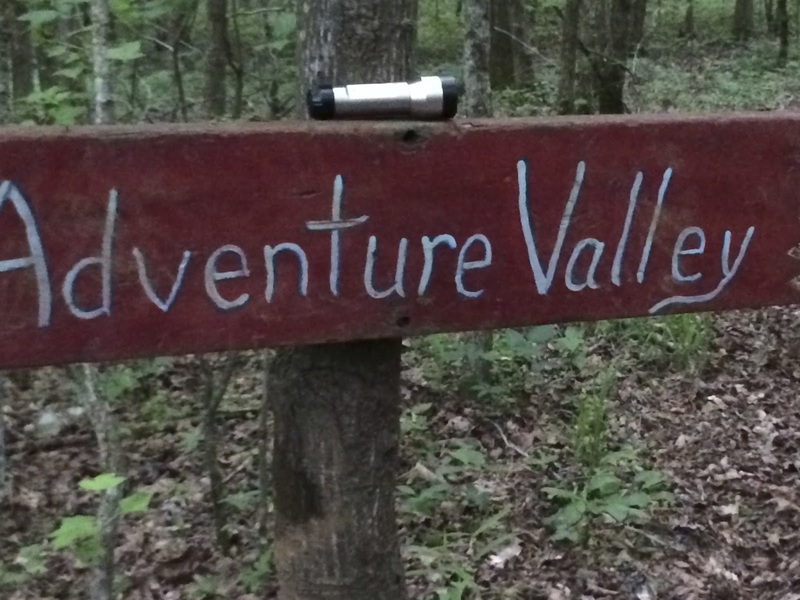 The Adventure Valley post was supposed to hit the Interwebs earlier this morning but due to a variety of conflicts (mostly my own laziness) it has been delayed until now. 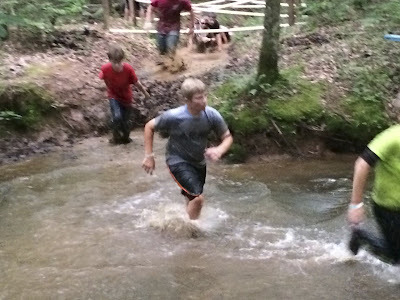 Adventure Valley is a popular mud run and obstacle course that is traditionally run on Monday evenings at camp. The idea for the course came from a similar program at the 1989 BSA National Jamboree. 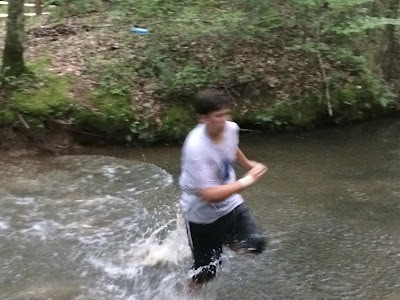 Sequoyah staff adopted the idea and have been "running" it since the summer of 1990. 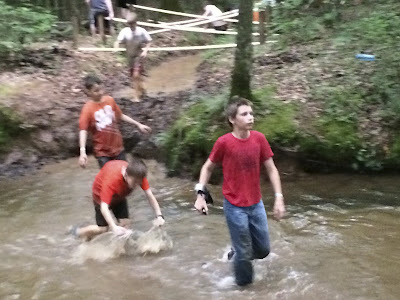 Although it is a popular program, most of our Scouts were not attracted to the thought of getting dirty. 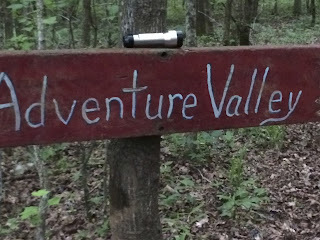 Instead the lure of the water slide was greater than the valley. Creighton, Rusty, and Ethan were the only Scouts who completed the run (sometimes making multiple trips through the course). They were accompanied by Mr. Dagg who also made several turns through the valley. Mr. Williams also risked soiling his footwear to bring us photographic evidence of the experience. 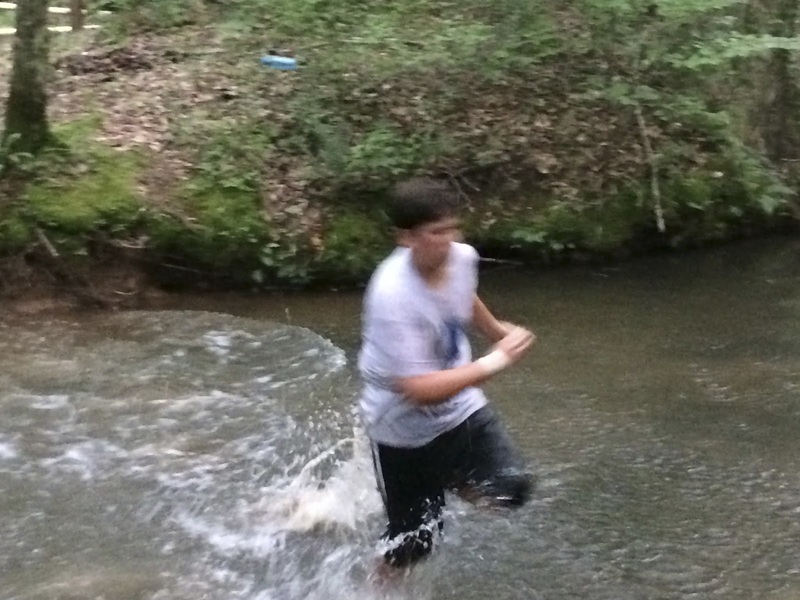 Rusty wades into the creek. Ethan appears suspiciously clean after his first trip through. Although there was initially a problem starting the water pump the supplies one of the essential ingredients for mud, eventually, it began to pump out a nice stream to create an adequate amount of the sticky stuff. 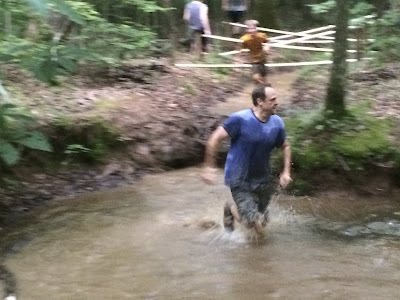 Several of the participants duct taped their shoes to their feet to avoid losing them during their turn through the course. Creighton moved so fast that his image could not be captured with sharper resolution. Mr. Dagg channels his inner teenager. As darkness began to fall, the muddy participants began their journey back to Turkey Flats. We thought it best to turn the hose on them to rinse off some of the mud before they hit the showers. Alas, the amount of dirt exceeded the ability to adequately return their clothing to anything resembling clean and the shower floor later testified to the amount of mud that had to be scrubbed off their persons. By morning, they appeared none the worse for wear but satisfied that they had given their all in the name of mud and exercise. Further photos have been added to Monday's entry in the online photo gallery.